Has it already been a week since my sister and I spent the day in Hendersonville? Onward and upward, we soon came to that stretch of the road that I love, the one that lets you know you’re about to enter mountain territory. I always get a little thrill from that. We popped some Orbit gum in our mouths to ease that weird feeling in our ears as the air pressure changed, and then we commenced to oohing and ahing over the trees and hills and rocks and rills. 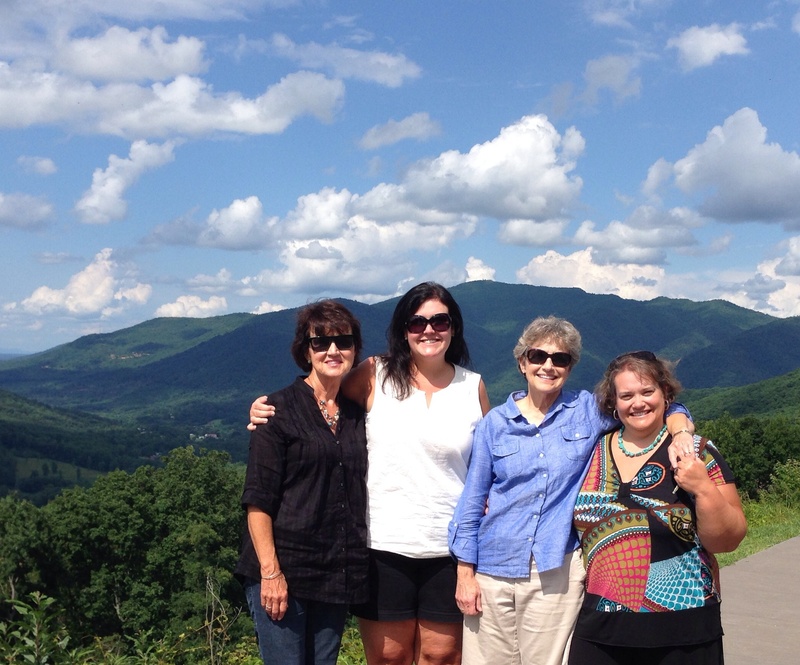 Upon arrival in Hendersonville, we parked in the Maple Parking Lot and headed to the Mountain Deli for lunch. One of the many things I enjoy about this deli is that they’ll make your sandwich just like you like it. If you don’t want mayo, just say so. If you don’t like tomatoes, that’s fine too. Our sandwiches, turkey and BLT, were delicious, and sitting outside while eating added to the dining pleasure. The ambience of Main Street was marvelous, and the culture and feel of the area enhanced our already upbeat moods. A couple of women and small children sat next to us, and I enjoyed listening and watching the little boys play with each other, probably because they reminded Ann and me of our sweet boys, now adult men. A policeman walked up, squatted down, and began talking to the little fellows, and I could tell that they were a bit awed. Hunger satisfied, we strolled up the street in the September sunshine and soon arrived at the Mast General Store where we browsed for an hour or so. Upstairs we registered for a door prize and sipped some delicious hot apple cider. We also sampled some Burt’s Bees hand lotion, and I bought some BB’s hibiscus lip balm. Outside of the store, we watched someone taking pictures of dogs, five of them all lined up eying the photographer. The way the dogs’ heads all turned in synchrony to owner’s commands was pretty amusing. Leaving Mast, we sauntered up one side of Main Street and down the other, loving the freedom of being outside and of having a day away from the regular routine. 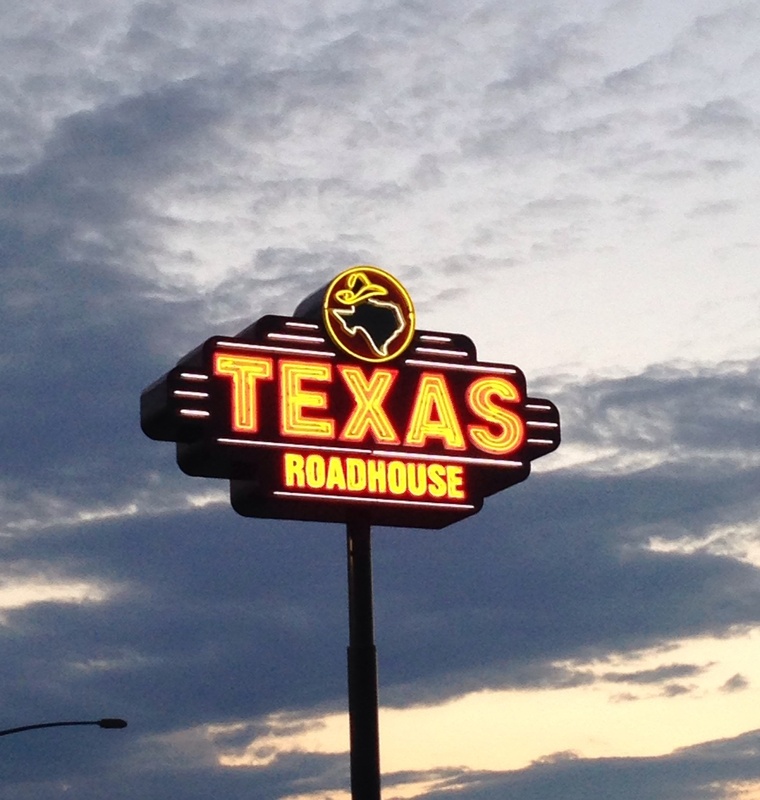 Everyone needs an occasional day out of Dodge. 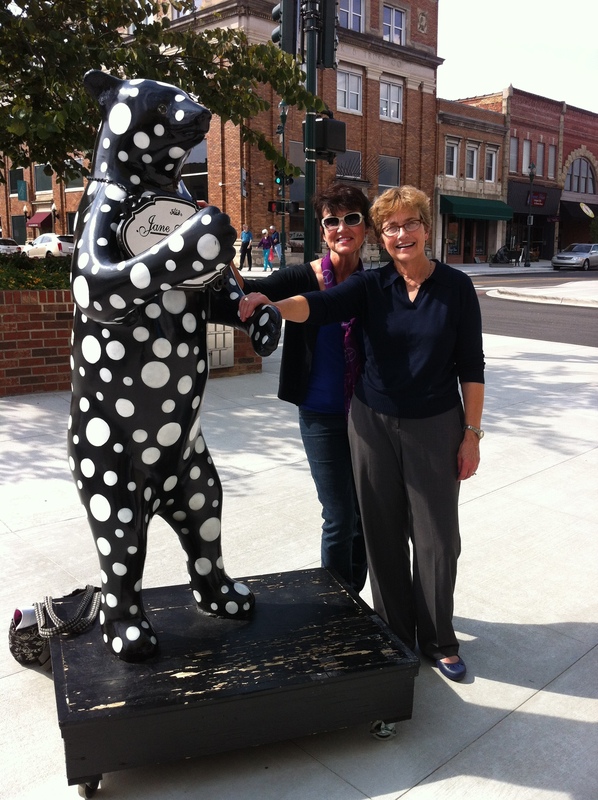 Main Street has bears, artsy ones, and we had fun reading about their origins. My favorite was Juliette Bear Lowe who looked like a male bear and yet was the founder of Girl Scouts. We went in and out of too many eclectic shops to recount, ll unique and inviting. Before leaving the downtown area, we shopped in Kilwigs where Ann got some ice cream and I purchased two huge chocolate and caramel covered apples. How could I not? I was in Apple Country after all. 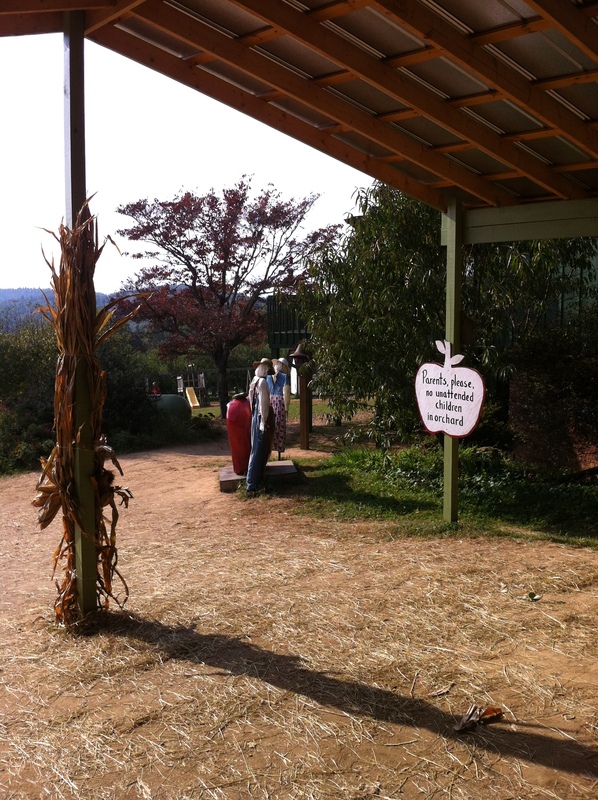 Back in the car, we eased out of town towards Sky Top Mountain Orchard. Every time I visit this orchard , it’s an even better experience than the time before. There are now more kiddie diversions like pumpkin and apple playhouses, and children were climbing and scampering all over the place, their parents happily watching nearby. 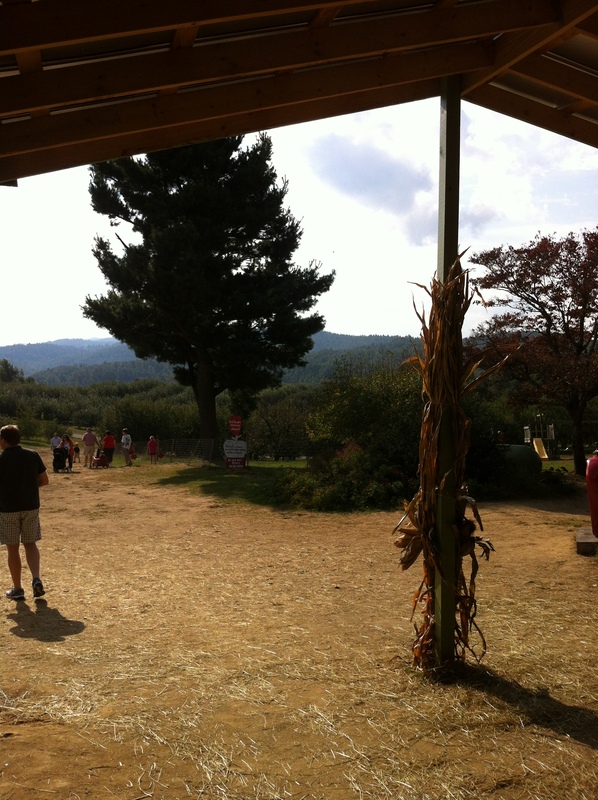 I was a little concerned that Ann and I might be among a handful of people there, but wowza, the mountaintop was covered with folks just like us, people eager to get out on a fine fall day and gather some apples. While we spied many people gathering apples and loading them into wagons, Ann and I took the easy way out and bought some already picked. One of the neat things about this orchard is that there are always apple slices to sample for those who are confused about which ones to buy. This day, however, they were swarming with wasps, so we based our choices, Cameo and Gals, based on written descriptions. I also bought an apple pie and an Asian pear, and we both purchased some sugar-free apple butter. Before leaving the area, we stopped at a The Wrinkled Egg, a unique little shop with a wide variety of items. After the woman manning the store informed us that she’d be closing shop in five minutes, we quickly settled on some inexpensive bracelets as mementoes of the day. If you want to shop at the Wrinkled Egg, be sure to go early enough to avoid being shooed away promptly at 5. There’s also bakery with all manner of sweet delights on the premises; it stays open until 7, and the cookies and muffins are delicious! We savored our bakery delights as we talked and talked and talked all the way home. Most of our chatter involved family events, memories, and issues. While it was just the two of us, our conversations throughout the day reminded us of the web of connections of which we’re a part. Ann and I are back in our separate worlds today, but for a few hours on Friday, past, present and future collided in a lovely mountain setting, and I’m looking at our getaway as a precursor to a fabulous fall. Author jayne bowersPosted on October 4, 2012 October 4, 2012 Categories family, Hendersonville, life, Mountains of NC, travelTags Hendersonville, mountains of NC, travelLeave a comment on Day in Hendersonville. It’s official. This year I’m really a hunting widow. DH frequently says, “When I retire, I’ll go anywhere you want to go because then I’ll be able to hunt during the week and have the weekend free for whatever you want to do.” Yeah right. Never a person to sulk (at least not for long), I decided that I could either wait on him or begin going and doing NOW. Actually, I’ve always been somewhat of a solo act in some ways because I realized early in my life that I’d never get to go anywhere or see anything if I waited for someone else. 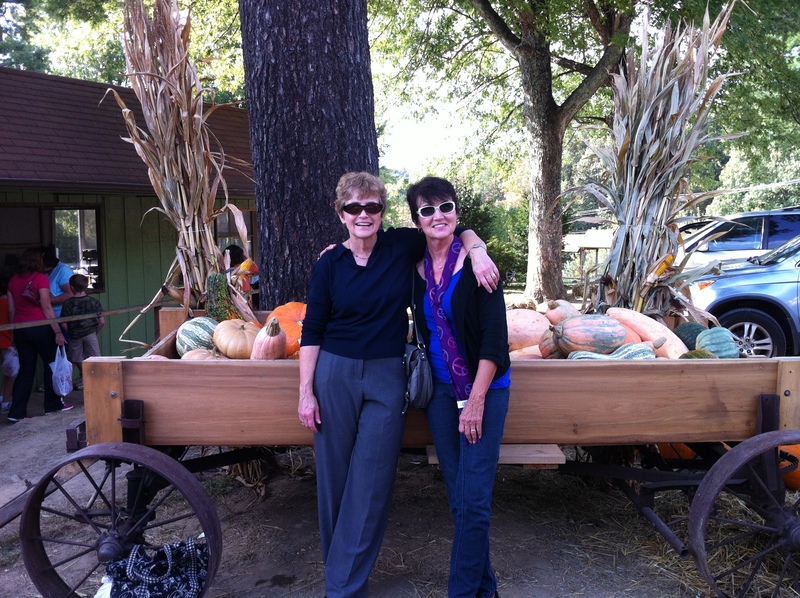 Hence, yesterday my sister-in-law Lisa and I went to Hendersonville for a day of shopping, dining, and apple buying. Although the leaves were still mostly green, the weather was bone chilling (I kid you not), and it was a perfect day for mountain travel. We left Blythewood a little after 7:00 a.m., and with no men along, we agreed that we were going to concentrate on the journey and not the destination. You ladies out there know exactly what I’m talking about, right? On the outskirts of Spartanburg, Lisa mentioned that she and my brother had memorized where all of the Starbucks locations were along the road. She said it so longingly that I knew she wanted to stop, so naturally I encouraged her to. We got to Barnes and Noble outside of Spartanburg a few minutes after it opened, and while she got her Starbucks drink, I searched for this month’s book club selection (Moloka’l by Alan Brennert) and bought a couple of gifts. Then we noticed a nearby TJ Maxx and decided to take a quick walk-through. How could we not with it being right there and all? Do I need to tell you how my husband and brother would have reacted to this side trip??? Back in the car and on the interstate, we saw the first glimpse of the mountains almost right away. It’s always a kick. It wasn’t long before we arrived in Hendersonville, and the Curb Market was our first stop. People from nearby communities bring jams, jellies, baked goods, plants, jewelry, pictures, and other merchandise to sell there, and Lisa and I bought some damson plum jam and pumpkin brownies. I also bought the beautiful wreath above. From there we visited a huge antique mall, a consignment shop called Two Chicks, and the Mast General Store. We LOVE that place, and yesterday we browsed through the crowded store sipping hot apple cider with dozens and dozens of other shoppers. After devouring burgers and chips at Mike’s on Main (lots of ambience) and a brief visit to McFarlan’s Bakery, we headed to the Sky Top Apple Orchard. Lisa and Mike’s Camry wound its way to the top of the mountain in Zirconia where we were fortunate to find a parking place. As we walked towards the huge open-air facility, we saw a long, long line of people waiting for hot donuts. I found that somewhat amusing: the crisp healthy apples juxtaposed to the not so healthy hot donuts. We bought some Winesap, Gala, Fuji, and Cameo apples after checking the place out. There was hot caramel for apple dipping, a dozen or more varieties of apples, apple slice samples, hot cider, hundreds of jars of jams and jellies, and a variety of cake and muffin mixes. Shivering, we finally made our purchases and headed down the mountain. Somehow we missed our exit and ended up in a little hamlet called Tuxedo. The men would have had a stroke, but we loved our little side trip around the lake. I can’t help but think of how it must feel to wake up every day with the lake on one side of your house and the mountains on the other. We arrived at Lisa and Mike’s house at 7:35, allowing me just enough time to change and freshen up before meeting DH at the Voice Male concert. It was awesome, the perfect ending to a perfect day. I’m still awed at their talents. “The Shadow of Your Smile” was probably my favorite, but then the chipmunk thing was good too. And so was the “choreography,” if you can call it that. Amazing! So what’s the point of the above rambling? It’s to remind you (and me too!) that the world’s a great, big beautiful place, and we can either sit around and talk about how we’re going to do this and that SOMEDAY, or we can just do it. Also, when on a trip, we need to enjoy every moment of it, even the side excursions. And finally, even when you’re really tired and just want to go home, add the icing on the cake, that last little event that tops off.